The FatCage MB155SP-B features a 3 mode fan speed jumper which can be changed at will to control the fan speed easily. The 3 modes include: High, Low and Off with respective speeds of 100%, 60% and 0% relative to maximum output. The settings can be simply changed by removing the jumper and relocating into the desired setting. 5 in 3 RAID backplane module. Large 92mm cooling fan with full metal body for excellent heat dissipation for the most intense applications. 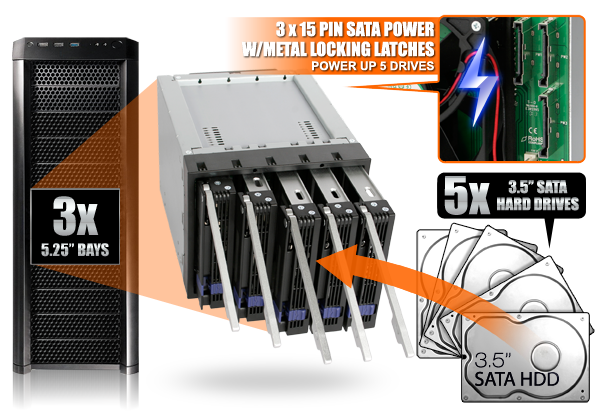 Compact and space saving to fit multiple drives. Interchangeable EZ-Tray tray design for internal drive security, exchangeability, expandability and maintenance capabilities. Compatible with DataCage Classic MB45X, ICYBento MB559 & ICYCube MB561 series. Enhanced Direct Air Flow Design – Shuts off most vents while adding larger ventilation slots on the backplane PCB. Uses SATA 15 power ports for best compatibility with the newest power supplies. Individual LED hard drive power & activity status notification. Active Power Technology (APT) - individual led & cooling fan only powers up if there is a drive installed in the bay. 3 Mode Fan Speed Jumper of high / low / off (100%, 60%, 0%). Fully Modularized rear outtake cooling fan for easy maintenance or aftermarket replacement with 2 and 3 pin power ports available.